Here are some features that make us different from the rest: Our wide-mouth drinking bottles comes with the - international patent application filed - cap with two openings: one having the perfect size to drink directly from the flask without spilling, the other one to easily refill it, also horizontally under the tiniest dispenser. The cap is absolutely leak-proof for carrying in a bag. It comes in two version: one made of vacuum-insulated stainless steel and one made of borosilicate glass. Unlike wide-mouth water bottles from HydroFlask or LifeFactory, you dont have to choose between two different caps, one being leak-proof for carrying or another for easy drinking, but not being leak-proof any more. 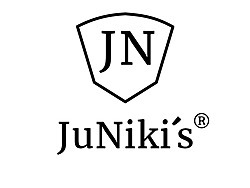 With JuNiki's Double Neck flasks, there is just one cap. Convenient. Easily take your favorite drink wherever you go. Copy your unique referral link. Refer to your Kickbooster dashboard to monitor your referrals and commissions. If you need any additional assets to use, such as videos or high-resolution photos, be sure to check out our Media Kit!